This entry was posted on Monday, February 2nd, 2009 at 12:02 am	and is filed under Uncategorized. You can follow any responses to this entry through the RSS 2.0 feed. Both comments and pings are currently closed. I think I know that person! I think I work with her! Despite being on the web (writing, not so much blogging) since the mid-90s, I have not quite embraced social media networks. 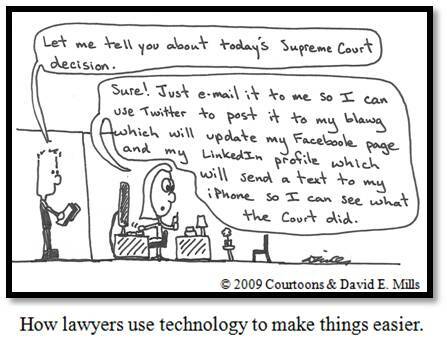 As I finally figure out the appeal of tweeting, this courtoon makes me laugh with delight. I want to be aware, but not succumb to the point of alienating myself like the person in the courtoon. Count us in as admirers of your blog and your varied artistic renderings. We have posted this ‘toon to Wise Law Blog. All the best.